This entry was posted on November 1, 2007 at 10:31 pm	and is filed under Blogroll, Remote Desktop, Tips. Tagged: Remote Desktop, Tips, Windows. You can follow any responses to this entry through the RSS 2.0 feed. You can leave a response, or trackback from your own site. Wow, what a great tip. The fact that an RDP file is really an INI-style text file is no secret, but the smart sizing addition is one that I have not seen before. Nice find. Well done! Our main software product here has a minimum resolution requirement of 1024×768. Your tip allowed me to get a client connected over remote desktop from his new 800×600 sub-notebook. Fantastic! So I changed the default.rdp file as suggested on the controlling pc. I have a 1024 X 768 remote (controlling pc) and a 1280 X 1204 (controlled pc). My full .rdp file follows, but when I connect, I still get scroll bars. Any ideas? Also you won’t be able to go above the resolution supported by the target PC. That did it – not sure why my default was different from others but works great now. I have used PCAnywere in the past. Remote desktop is faster and the screen scaling algorithm is better for sure. I have the opposite problem. I have a 1900 x 1200 resolution and I want the RDP connection to be at a lower resolution. Or did you want a fullscreen display at a lower resolution? That is not supported that I know, I don’t know a workaround for this case. Thanks for the reply. Setting that option just makes the screen windowed and scales down the fonts and graphics so they are even smaller. Is that the same as setting them in the RDP gui? From what I’m reading I don’t think you can have either a windows or a full screen RDP session at a lower resolution than the host panels resolution. Back to the joys of Googling to infinity looking for that one nuggett of relevance! In the GUI you don’t have the “smart sizing” option. However you can edit the default.rdp file in a text editor (it’s in My Documents, you might need to show hidden files) and add the “smart sizing” line manually. Then going in the GUI and choosing a resolution will display the remote machine in a window that will resize. Thanks for putting up with my questions! The Smart Sizing option only seems to size the screen smaller. What I need to do is set the screen to a resolution of say for example 1685 x 1050 (My native host panel is 1920 x 1200) and then Smart Size it upwards so the fonts etc scale upwards so I can read them easier. Set the remote resolution to 1685×1050, without the smart-sizing, so that it is now displayed in a window at 1:1 ratio. If you now press Ctrl-Alt-Pause, what does it do? That’s the shortcut for fullscreen, with smart-sizing it will force a bigger screen on a smaller local monitor but I have not tried it the other way around. Thanks for all your help, it’s much appreciated. If you think of anything else I’m all ears but at this stage I think it will involve rabbitt ears coming out of a magician’s hat! thanks for the tip ! works perfectly ! MS: You need to integrate this into Options GUI!!! Beautiful! This should be included in the GUI…Thanks for making the nasty scroll bars go away. Thank you so much for this great advice (smart sizing:i:1). Tried this on Windows XP and it worked great, but tried to configure for a user running Windows 7 and it does not seem to work. . . .any suggestions? – Make sure “screen mode id” is set to 1 (windowed mode). Mode 2 (fullscreen) ignores the smart scaling setting. Note once you have successfully opened a scaled window, you can switch to fullscreen (still scaled) by pressing Ctrl-Alt-Pause. – The Desktop Composition setting does not work well for me. It may also be something to look into. One thing you could try is to use the .rdp file you tested in Windows XP and use it as is in with Windows 7. Ok, so the screen mode id settings part worked, but the full screen shortcut does not seem to be working. Any thoughts? P.S. Client is set at 1366 X 768 so I set RDP res to the same.In “Local Resources, “Apply Windows key combinations” is set to “On the remote computer” per your instructions. The shortcut Ctrl-Alt-Pause is independent from the RDP key settings. It’s not sent to the server at any point, it simply tells the client window to toggle fullscreen. In some places I’ve read that the shortcut is Ctrl-Alt-Break. You may want to try that as well. The resize option only works to scale the display down. In your case, it’s possible you simply need to set the desired resolution with desktopwidth and desktopheight. For example, if your 24″ screen is 1920×1200, you would need to use that (or higher) as the resolution in the rdp file. For what it is worth, the Mac RDP client (made by Microsoft) will scale UP a RDP session. As an example, if you are running a native resolution of 1280×1024 on your Mac, and connect to a RDP session using 800×600, you will get a small window that does not fill the screen. 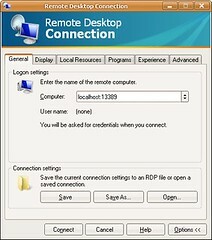 Then, on the Mac RDP menu, click on View, Full Screen and the client will scale up the session to fill the screen. Why Microsoft has this feature for the Mac RDP client but not for their PC version(s) defies all reason.